How to list all comma separated values in all columns of a tabele as single. How to list all comma separated values in all columns of a table as single column. is new datatype in sql server 2005. We can user SQL Statements to select data from XML string.this xml datatype helps us great to do many complex operation in less line of code. 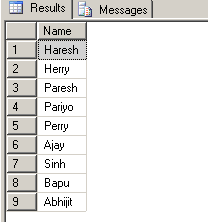 --Create tabel and insert data to see this example in action. after completing object creation we can use followint Query to select all comma separated values of each row to a single column..
FROM @ColumnXML.nodes('/NM') as ParamValues([Name]) . After Runnig this you will get result (Fugure-2).